William Scott's Troublemakers explores how a major change in the nature and forms of working-class power affected novels about U.S. industrial workers in the first half of the twentieth century. With the rise of mechanization and assembly-line labor from the 1890s to the 1930s, these laborers found that they had been transformed into a class of "mass" workers who, since that time, have been seen alternately as powerless, degraded victims or heroic, empowered icons who could rise above their oppression only through the help of representative organizations located outside the workplace. Analyzing portrayals of workers in such novels as Upton Sinclair's The Jungle , Ruth McKenney's Industrial Valley , and Jack London's The Iron Heel, William Scott moves beyond narrow depictions of these laborers to show their ability to resist exploitation through their direct actions-sit-down strikes, sabotage, and other spontaneous acts of rank-and-file "troublemaking" on the job-often carried out independently of union leadership. 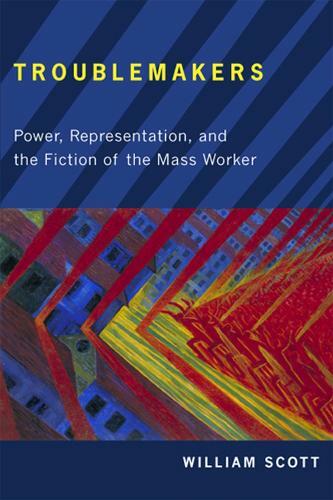 The novel of the mass industrial worker invites us to rethink our understanding of modern forms of representation through its attempts to imagine and depict workers' agency in an environment where it appears to be completely suppressed. "Troublemakers is an entirely commanding and engrossing study of the new forms of workers' control and representation that modern mass-industrial work made available--rich and strange in archive, theoretically fresh and creative, historically acute." --Eric Lott "University of Virginia "
"Troublemakers is an original take that provides eyeopening insights about different ways acts of resistance by the mass worker, including a refusal to work, may be represented. Scott has added a polished contribution to the list of essential interpretations in the field." "William Scott's Troublemakers, though in part a work of literary criticism, in fact offers fascinating insight into the modes of resistance adopted by the mass industrial worker in America between the 1890s and the 1930s."